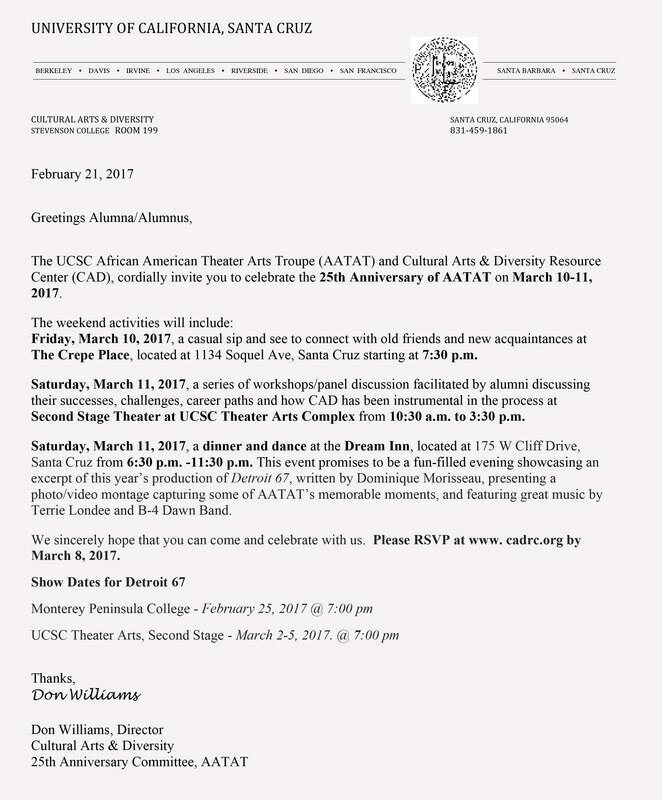 The UCSC African American Theater Arts Troupe came together in 1991 with their first performance as a student group mentored by Don Williams. The first performance, Ceremonies in Dark Old Men, was produced and directed by Don Williams in May 1992. This production, through donations alone, raised $1500 to establish the African American Student Scholarship Fund. This production ran for four nights at Stevenson College. At attendance we had 250 staff, students, and community came out nightly. Ceremonies of Dark Old Men ran for four nights at Stevenson College and the attendance at this venue was a little over a thousand theatergoers. To establish the scholarship fund, donations were accepted at the door. The African American Theater Arts Troupe production was created to address the great need of retention for African American students who were leaving the campus because of isolation and the creative gifts of the community that were not exposed. Many of its members were senior students who had it in their hearts to establish a vehicle that would allow incoming students a chance to express and inspire one another through means of art.